Once per turn, Zhu Rong can discard a weapon to damage any player in her attacking range. Whenever Zhu Rong causes fire damage during her turn, she draws a card. She then competes with the person that received the damage. If she wins, the fire damage is increased by one. In either situation, the target keeps their competition card. "Flying Knife" works in a similar fashion to Dian Wei's "Assault". Zhu Rong can discard either equipped weapons or weapons in her hand. If she discards her equipped weapon, she cannot use that weapon's reach for "Flying Knife". Whenever Zhu Rong causes fire damage during her turn, she must follow through with "Fire God". 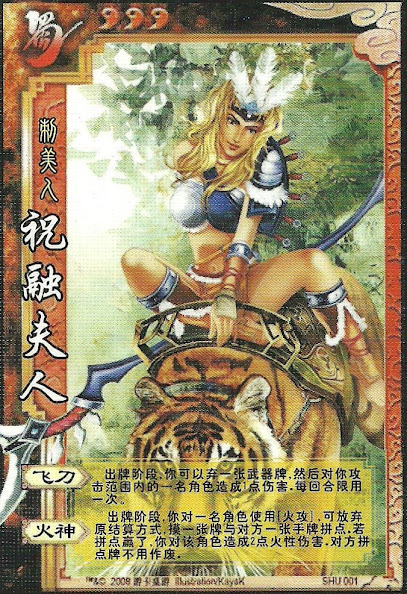 If a target does not have any hand cards to compete with Zhu Rong for "Fire God", she does not compete with them. She still draws though.